This is a revised version of the first socks. I reknitted the socks to get rid of some confusing parts. I hope you enjoy making it. 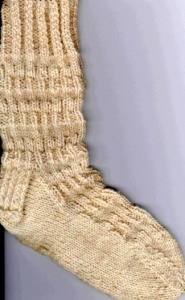 It is a very easy pattern for the beginner sock knitter. Rounds: 5 and 7 K1, *p1, k2* repeat between * end p1, k1. Rounds: 6 and 8 K1, p1 *k2, p1* repeat between * end k1. Rounds: 9 and 11 P2, k1, repeat around. Rounds: 10 and 12 P2, k1 repeat around. Cast on 48 stitches divide evenly onto 4 needles using 5th needle join without twisting. Begin twisted rib above and knit for 2 inches ending with row 1. Work pattern stitches for 7.5 inches or desired leg length ending with row 12 of pattern. Knit 1 row. Break yarn and slip 12 stitches from needle #1 to needle #4 for heel flap. Row 2: slip 1, *K1, slip 1 across repeat from *. Continue to repeat above for 24 rows ending with row 1 and wrong side facing. Row 1: Purl 14 stitches, p2 tog, p1 turn. Row 2: Slip 1, k5, ssk, k1 turn. Row 3: Slip 1, p6, p2 tog, p1 turn. Row 4: Slip 1, k7, ssk, k1 turn. Row 5: Slip 1, k8, ssk, k1 turn. Continue as established until all stitches are used up. There are now 14 stitches on your needle. These are your heel stitches. With right side facing pick up and knit 12 stitches along left side of gusset, knit across 2 instep needles, pick up and knit 12 stitches along left side of instep knit 7 stitches from heel needle mark for center of socks and beginning of round. Your stitches are divided thus: 19 stitches on needle #1, 19 stitches on needle #4, 12 stitches on each instep needle. Knit to last 3 stitches, k2 tog. k1 work round 3 of pattern across instep needles, k1, ssk, knit to end of 4 needle. Keeping instep pattern correct, continue decreasing on needles # 1 and 4 only until there are 12 stitches on these needles. There will be 12 stitches on each of these 2 needles. Total 48 stitches in the round. Round 1: Knit to last 3 stitches, k2 tog k1, needle 2 and 3, k1, ssk, knit across to last 3 stitches on needle #3, k2 tog k1, needle 4 k1, ssk; knit to end. Repeat above rounds until you have 16 stitches in the round. Put bottom stitches on one needle and top stitches on one needle graft.